Suggested contribution: Free, donations accepted. All are welcome. Lama Kelsang will lead interested students in reading and understanding Patrul Rinpoche’s book The Words of My Perfect Teacher. This book, a favorite of Tibetans and recommended by the Dalai Lama and other senior Buddhist teachers, is a practical guide to inner transformation and introduces the fundamental spiritual practices common to all Tibetan Buddhist traditions. 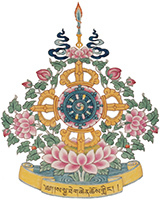 The Words of My Perfect Teacher is the classic commentary on the preliminary practices of the Longchen Nyingtig and a spiritual treasure of the Nyingmapa school, the oldest Tibetan Buddhist tradition. Ven. Lama Kelsang was born in 1980 in India. In his early twenties, he entered Sakya College in Dehradhun, India where he took monastic vows. There, he studied Buddhist philosophy for about five years. During these years, he also received empowerments and teachings from H.H Dalai Lama, H.H Sakya Trichen Rinpoche, H.E Luding Khen Rinpoche, H.E Thartse Khenpo, and Khenchen Kunga Wangchok. He next went to Nepal’s Tharlam Monastery and completed a Manjushri retreat for three months. He received the Lamdre from H.H. Jidgal Dachen Dorjechang Sakya in 2007. He was appointed as a Chinese language tutor to H.E Asanga Rinpoche, a position he held from 2008 until 2012. After 2012 he was on a three year retreat. He has completed five times the requisite one-hundred thousand accumulations for the preliminary practices (ngondro) and has also completed the preliminary and main practice of Luminous Great Perfection, and the ritual practices of the Longchen Nyingtik tradition.